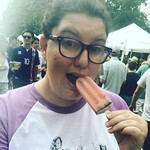 I had some disturbing dreams last night, I sat down with all intention of writing about them and instead I have chose to write about my favorite coffee mugs. 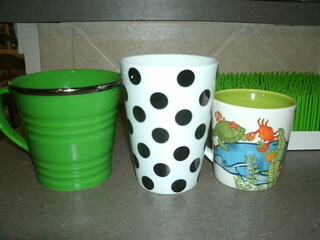 These are some of my all time favorites, they hang in my kitchen and are not in the rotation to be used. Please note my Mustache mug is from my parents collection older then I am. Sadly two of my all time favorites have gotten broken, I once got a Wonder Woman mug and before I could ever use it was broken (I was super excited about this mug) and I once had a mug from Starbucks that was pink and covered with hearts (that Casey broke putting up the dishes once). 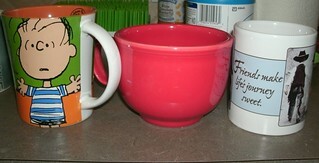 as I mentioned in a previous post I have loved mugs long before I ever liked coffee. 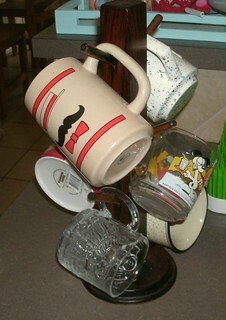 I would beg my mama, to let me drink everything out of mugs. I will fully admit that I paid more that Yoda mug then I have paid for shoes, I had to have it though. I think I have admitted before of my Love for the Jedi Master. Sadly this post isn’t even showing you probably a fourth of my mugs, I have almost all teh mugs that came with my fiesta dishes and other odds and ends from through out the years. 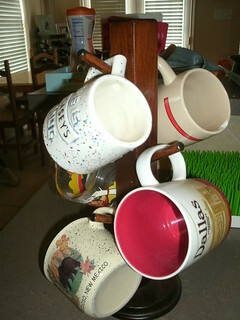 I also can tell you where almost everyone one of my mugs come from and the story behind it. 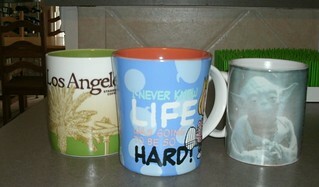 I will not tell you every story of every mug, that would take all day and probably bore you all to tears. I needed to write and didn’t want to write about my dreams/fears so instead I right about mugs. How enlighten, eh? Thanks for bearing with me, I know that running from my dreams isn’t going to fix the feelings. I am going to process more and then tell you about them. 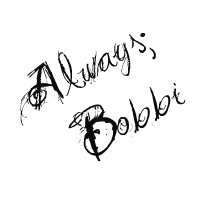 This entry was posted in Bobbi Janay, everyday and tagged Bobbi. Bookmark the permalink. Girl, I am running from everything in my life at the moment, so I get ya. I like your mugs, though! Yes, but I can’t run forever. My therapist notices when I am trying to avoid things.